View cart “Car Scenter” has been added to your cart. The Ultimate in Essential Oil Diffusion! Beyond Diffusion is our most popular diffuser. It incorporates an air filter that scrubs air entering the diffuser, intercepting pollen, bacteria, dander, dust mites and some viruses. This in-line filter never needs cleaning and lasts up to 3 years. The three-way switch allows you to continuously fragrance your environment or switch to an intermittent cycle of 5 minutes on and 25 minutes off. This conserves essential oil and helps reduce olfactory overload. This advanced diffusion system is designed for intermittent or continuous operation and holds a one-ounce (30ml) bottle of essential oil. Patented nebulizer breaks up essential oils into micro-mist and blends it with the air you breathe. Air entering the nebulizer is first scrubbed with a hygienic filter that intercepts pollen, bacteria, dust, smoke, smog, dander, and viruses even smaller than HEPA filters can catch. This filter never needs cleaning and lasts one year or more. The selector switch allows continuous operation or intermittent cycle of 5 minutes on, 25 minutes off to maintain desired environment while saving precious oils. 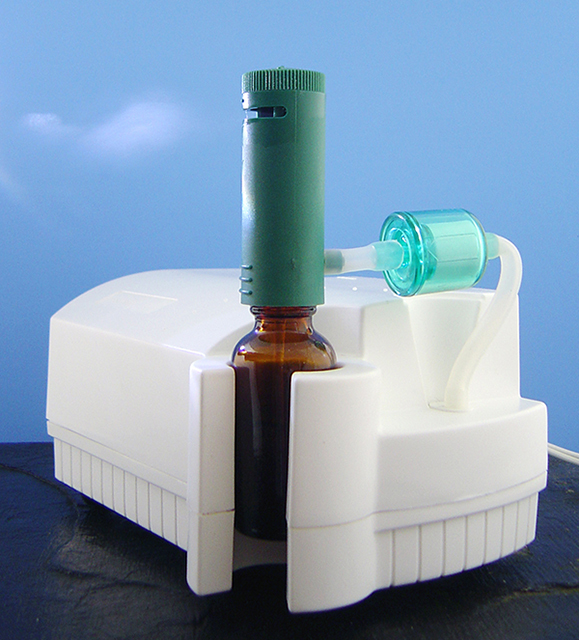 Adjustable nebulizer cap also regulates the amount of essential oil diffused. 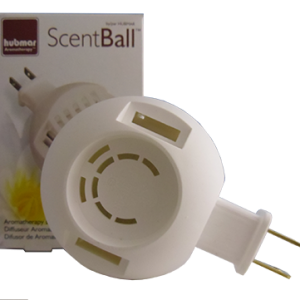 Our patented diffuser propels a thin micro particle mist of essential oils into your environment. By revitalizing the air with their antiseptic action, the oils become an important part of your health maintenance program. The EssentialAir Beyond diffuses essential oils through cold diffusion preventing any fragrance alteration due to heat. It is user friendly, just turn it on in the morning and it will run intermittently throughout the day diffusing fragrance into an area up to 1,000 square feet. Compressor – This provides the air power to project the scents. 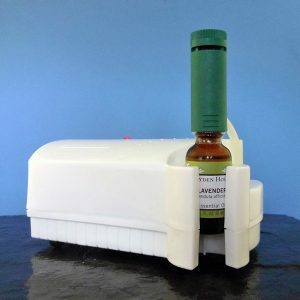 Green Nebulizer – The nebulizer turns the essential oil into a spray, and then a mist, which circulates on air currents. The cap rotation allows you to decrease or increase the output. The black filter inside the green nebulizer helps turn the spray into a mist. You could operate the nebulizer without the black filter; this would increase the power of the spray. Amber Bottle – this one ounce (30ml Boston round) bottle is the only style that fits into the EssentialAir Beyond. Essential oils that come in blue euro style bottles will need to be transferred to the amber bottle. 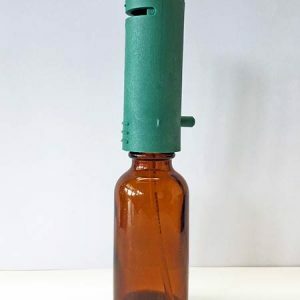 If ordering from Leyden House Ltd., you may request your one-ounce (30ml) order to be packaged in amber bottles. Dimensions: 7 ¼” x 5″ x 3 ¾”. Essential oils, when diffused, can be the best air filtration system in the world. Purify by removing metallic particles and toxins from the air. Increase ozone and negative ions in the house, which inhibit bacterial and viral growth. Destroy odors from mold, cigarettes, animals, etc.